Currently the co-presenter of RTÉ 1’s late afternoon programme “The Daily Show” with gaelgóir Daithí Ó Sé. 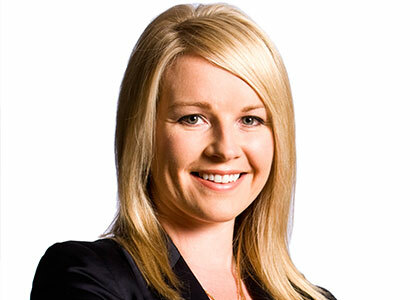 Claire has a wealth of broadcasting experience spanning 13 years in the business. She began her career in radio and worked for the BBC in the Channel Islands as a broadcast journalist before becoming News Editor with a Channel 103FM. Nine years ago Claire returned to Ireland and began working with TV3 as early morning News Anchor with the station’s breakfast programme, Ireland AM. Following two and a half years of early starts, editing and producing her own bulletins, she moved to London to take up a position as News Anchor with Channel 5 and the ITN News Channel. But it wasn’t long before TV3 beckoned once again and Claire returned to Ireland to take up the job of Ireland AM presenter. From there, she became the main evening News Anchor on TV3 before making the move back to radio and Newstalk 106 to 108 where she co-anchored the breakfast show with Ivan Yates from 6.30 to 9am Monday to Friday. Claire Byrne is also a columnist with the Sunday Tribune and is a regular host and MC at awards events and ceremonies throughout the year.